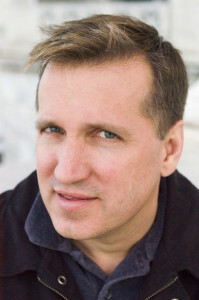 I’ve been collaborating for most of my professional life as a screenwriter and as a novelist. For twenty years, I wrote & produced TV shows with William Rabkin and plotted countless episodes with large writing staffs. I’ve also collaborated on over thirty books, most recently on the internationally bestselling Fox & O’Hare series with Janet Evanovich (our next book, The Chase, comes out on 2/25). 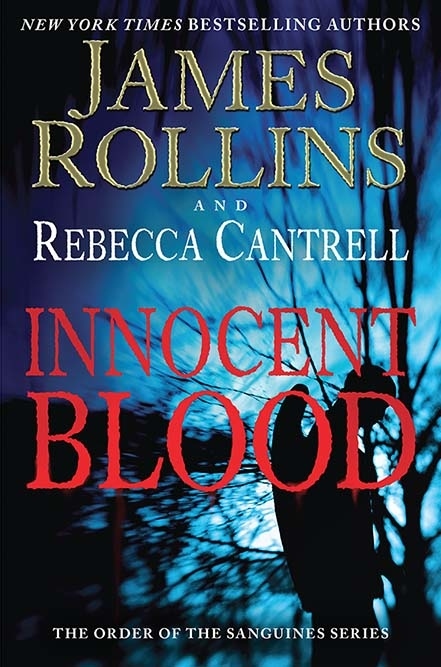 So I am always interested in how other writers collaborate…and when I learned that my friends Rebecca Cantrell and James Rollins were writing together, I had to find out how their creative partnership produced the bestsellers Blood Gospel and Innocent Blood. Their answers are fascinating…and tremendously useful for any authors who are thinking about teaming up on a book. How did you two meet? How did you decide to write a book together? Was there any initial reluctance or concerns that you had to work out first? Rebecca: We met at the Maui Writers Conference when I took a course in thriller writing from Jim. He blurbed my first book (thanks, Jim!) and we stayed in touch off and on afterward. So, we’d already known each other for a few years when Jim called to ask me if I was interested in collaborating on a project. When I asked for details, he said it was “confidential.” Trying to trick some information out of him, I asked if he could answer yes or no questions, which brought a ten-second pause before he caved and told me everything. Obviously he was not mean to withstand that kind of brutal interrogation! After he explained premise and the world, I said yes immediately—it was too intriguing and controversial not to. Jim: Yes, I would not withstand torture. As to the genesis of this series, I was visiting the L.A. Museum of Art, where they had a Rembrandt exhibit. I became fascinated by that Old World master’s depiction of the raising of Lazarus. There are many oddities about that painting: like why does everyone have such looks of horror at this miracle by Christ, why are there weapons painted above Lazarus’s tomb (according to the Bible he was merely a banker), and why in one version of the painting did Rembrandt have blood dribbling from Lazarus’s lips? This, of course, made me think “Hmm, maybe Lazarus was actually a vampire.” Yep, that’s how my mind works. And that got me wondering if vampires did indeed exist during the time of Christ, how might have Christ dealt with them. Would he have tried to save them? How would that have changed the Church? How might that look today? So I created a vampiric sect of the Catholic Church, vampires who swore an oath to Christ and the Church to stop feeding on humans and to only subsist on “Christ’s blood,” which for this series, is consecrated wine, which Catholics believe does indeed transubstantiate into the physical embodiment of Christ’s blood. Once I had this idea, a grand epic story slowly built in my head, one spanning history and delving deep into the divide between science and religion. I knew this story was too big for me to tackle alone, especially since what was in my head was not really my wheelhouse as a writer. I could bring my skill at twisting history and science and building elaborate action sequences, but this story needed more than that. It needed to be richly textured and gothic in atmosphere. Not my skill set. But from reading Rebecca’s books, I knew she could. So I thought, “what if we took the best of both our skills and crafted this story together?” So I made that call that Rebecca described above. How did you know your two voices and approaches to writing would ultimately mesh? Rebecca: We did a lot of work before we wrote the first word, tossing samples of scenes written in different styles back and forth until we found the ones that we thought would work best for this kind of story. We wanted something that was different from our regular voices. Once we agreed on that, we wrote to those styles. To make it mesh, we edit and edit each other’s work. After we’re done with that, we edit some more. Jim: We definitely challenged each other. Rebecca would push me to look deeper into characters’ motivations, while I tried to find ways to ratchet up tension and keep those action scenes taut and varied. But, like Rebecca said, it was a learning curve in regards to finding that “style” and “voice” for the story. Initially there was lots of debate and trials in regards to how to make all those choices fit the story. But eventually we discovered it and ran with it. How did you handle the plotting? Jim: The first thing we did was to build a “World Bible” for this world and characters. There’s actually much more in that bible than is actually in the books, but we needed to understand this world and its characters in as much depth as possible before beginning. This helped us have a roadmap from which to work from. And it’s still a work in progress as we work through this third book in the series. Rebecca: The world bible might end up being longer than the books! But it’s definitely been a great resource for keeping track of things and helping to keep us on track for plotting. Which brings me to the outline (and the next question). Do you outline? If so, how detailed do you get and how closely do you stick to it afterwards? Rebecca: For the first book Jim had a detailed plot outline in place, which we ended up deviating from quite a bit as time went on. For subsequent books we’ve done a lot of brainstorming via email and Skype. We usually come up with the big moments of the book and the locations first, then drill down into a list of scenes. The outline changes as the book moves ahead, but we expect that. Jim: For my own books, I generally work from a pretty loose outline, but to work together, it was clear from the start that we would need more of a paved road. I don’t know if we actually achieved that, but we at least carved out a gravel road. We mostly stuck with it, but it did allow us some elbow room to venture off a bit from that path. But I have to say, it’s sort of fun outlining with a partner versus doing it solo. It was that back and forth on Skype where some of the most imaginative elements of the story were created. How do you divvy up the writing? For instance, does one of you write the first draft and the other do revisions? Or do you trade chunks back and forth? Rebecca: We trade chunks back and forth. I usually first draft historical scenes, love scenes, and character-oriented scenes, whereas Jim does more of the action and plot-driven scenes. But there isn’t a hard and fast rule on that. Jim: Exactly. There is a small love scene in book two (Innocent Blood) that I tackled (not without a lot of blushing on my part) and Rebecca cracked out some very awesome ambush scenes. But I don’t think either of us would have been able to pull those off without going through the tempering flames of writing the first book. We both learned a lot from one another in that first venture. But one of the coolest things Rebecca once shared with me (and I think it highlights the success of our collaboration) is how one night she was reading a section of the book aloud to her husband and he stopped her and asked her who wrote that last paragraph she read. She had to admit to him, “I really don’t know.” That’s how intensive we are about editing, re-editing, and turning pages back and forth between us. Here’s a techie question about the process…do you both work on the same operating system (eg are you both on Macs? ), do you use the same software (Word? ), do you share files using a Dropbox, Google Docs, etc. or do you just send email attachments back and forth? Rebecca: I use a PC. I think Jim uses a Mac, but I’m not even sure. We email the manuscript file back and forth, using MS-Word with Track Changes and Comments. We only have one manuscript file and we’re usually pretty good at not stomping on the other guy’s stuff by accident, although I have had to use Word’s Compare Documents feature a couple of times. Jim: Until this very moment, I didn’t even know there was a “Compare Documents” feature on Word. But yes, we both use Word and I do indeed work on a Mac. How much time do you have to write each book? How do you handle the deadline pressures? Rebecca: About 6-9 months but we’re also writing other books at the same time. I’m pretty fast and Jim is ridiculously fast (which has made me faster because I can’t let him win), so we muddle through. We had some serious deadline pressure on a short story once and that’s where the time difference came in handy—Jim started when I was done for the day and I came back online when he was ready to go to bed, so we worked on it 24 hours a day. Crazy, I admit, but the story did get done quickly! Jim: I always work best (and fastest) under deadline. The first book (while it took about 6-7 months to write) actually took us just shy of a full year to create. Those additional months were occupied with building that World Bible, outlining, playing with styles, etc. With that worked out, we crafted the second book slightly faster. By the way, one other advantage in regard to having your writing partner living halfway around the globe is that difference in time zones does allow some magic to happen. It was not uncommon for one of us to end our day by emailing a series of “problems with the story” to the other—only to awake the next morning to find solutions to those “problems” in our in-box. It’s like having magical elves working on your project while you sleep. I come from television, so collaborating with other writers is easy for me. But authors are a solitary lot. I know many authors who would have a very, very hard time writing with anyone else. They’ve worked hard to develop their own voice. They are used to writing alone and not having to deal with the input of anyone but, perhaps, their editor and agent. How did you reconcile your individual approaches to writing novels so that you could work together? 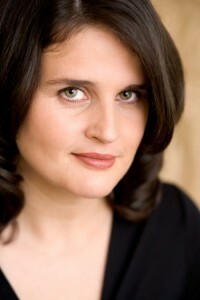 Rebecca: I was surprised at how easy it was. I’ve worked with teams of writers on technical documents before, so I was used to breaking things up and putting them back together, but I expected a lot more discord when it came to fiction. It helps that Jim is very easy to work with—mellow, generous, smart, and without a lot of ego. I think the work we did at the beginning to set up a world bible and the style we wanted it to be written in helped build up trust between us so that by the time we started writing the book itself we both were confident that we were working from a shared vision. Also, we communicate a lot during the process, with daily emails and weekly Skype calls, and that helps to make sure we’re both on the same page. Jim: And I had no background at all with working with another author. So it was probably a steeper learning curve for me than it was for Rebecca. One of the great tools she brought to the table, which indeed made things easier, was her organizational skills. She is very good at making sure all elements of the story stay on point. Also whenever some question would come up in regard to plot we had a simple solution: we would look to the story itself. How do you resolve disputes on plot issues? Or on the rewrites? Does one of you have the final word? Rebecca: Again, this has been a lot easier than I expected. Because we’re both committed to the same story, we don’t tend to argue about much. There was one scene at the end of Innocent Blood where we spent a couple of hours going back and forth about what a certain character would do, but it was more about us trying to figure out what the story needed than arguing for one position or another. I would say that the story has the final word, not either one of us. I think that we end up with stories that are very different than what we would have come up with one our own and that’s good. Jim: Exactly. Rather than letting ego be involved, conflicts were resolved by deciding what best suited the story. And that one time where a critical moment of the story had the two of us on diametrically opposed opposite sides of a fence, it was debating the pros and cons of our two positions that created an entirely new scenario, a better one, one we would never have come up on our own. Did you learn any lessons from your first collaboration that made the second one easier? Rebecca: I think we developed shorthand of communication that helped speed things along, but it was pretty easy from the start. Jim: I also think that having that World Bible grow alongside the crafting of the first book gave us a great foundation from which to write that second book (and now the third). And I agree that we have found ways to communicate much more efficiently. We both have learned somewhat how the other thinks and writes and that helps, too. I remember our initial forays on Skype were more tiptoeing around each other a bit, so as not to insult or come off too harsh. Now we’re even better friends that we can forgo the niceties and get down more quickly to brass tacks. Not that we’re harder on each other, just more real. Has your collaboration changed the way you write novels on your own? Rebecca: I’m faster now. Jim’s a faster writer than me and my pride forced me to keep up. I’m also more comfortable writing action scenes than I used to be. Jim: I’m also much more conscious of character and the emotional inner world of those characters. Seeing Rebecca’s approach to building character has definitely influenced my own writing. Based on this experience, and assuming you had the time, would you collaborate with other authors? Rebecca: Absolutely. It’s been a tremendous amount of fun! Jim: I wholeheartedly agree. But I also think it still takes finding that special person who complements your own writing and is simpatico with you on a personal level. For me, it was great (and I suspect a rare commodity) to find both of those in Rebecca. I thought I was pretty much done with vampires, but I’ll go back to the coffin one more time for this one. So alike and so different from the collaboration I did on a vampire series in the 90s. I’m glad my writing partner and I got it right without quite knowing how! I never read vamp books unless they’re by friends, but these have a fresh angle. Thanks for the tip! PN Elrod: I suspect there are as many ways to collaborate as there are authors doing it. Whatever works, works! 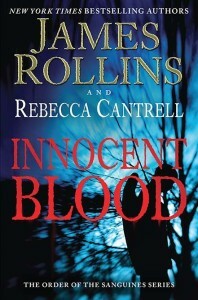 I’m reading Innocent Blood now and enjoying it a lot. I’m not familiar with Rebecca’s solo work, but I’m very familiar with Jim’s. I can see Jim’s influences, but the voice is different, as is the tone. Sometimes that’s not always the case (I’m thinking of Stephen King and Peter Straub’s collaborations, where I never could really see Straub’s influence much), but it seems to really work for you guys. Good job, great interview. I was going to pick up “A Game of Lies” today, after reading this I’m going to have to pick up “Blood Brothers” as well. Sounds like it’s going to be a good series read.